We also know that maps can be terribly misleading. Sometimes it can take a whole day to travel a mere inch. I seemed to forget the latter as I excitedly cobbled together an outline plan for my two weeks with the rather gorgeous Carado Vlow V600 Camper Van (or ‘Panel Van Conversion’ to the connoisseur). As the van itself had to be collected from and returned to Bavaria, I considered this to be the ideal opportunity to visit Croatia. I’d been yearning to visit Croatia for over 20 years, and besides, it was only a few inches on the map. Google even said that you can drive it in a day, so that would leave 12 days for relaxing and exploring… wouldn’t it? Well, it would have done, had I put my head down, paid the tolls, and hooned directly from Point A to Point B. However, while a total lack of planning might seem to align with the principles of a spontaneous ‘Go with the Flow’ kind of a trip, there is an unseen and unconsidered conflict. You see, everything was fine as I rolled gently through Austria, avoiding the motorways, and following my nose in the direction of the tantalisingly tempting snow-capped Alps. Thanks to my ACSI app, I found a couple of terrific campsites where I could rest up for a day or two and finally open up the Guide Books that I had downloaded to my tablet. As I read up about Slovenia and Croatia, my list of ‘Must-Dos’ grew rapidly. Driving over the Vršič Pass, which I had not even heard of until then, climbed to the top of the list. The Soča Valley, where the Vršič Pass would happily lead, was apparently unmissable. From there, it was only a few inches on the map down to Croatia. Perfect! The Vršič Pass did not disappoint. The Rough Guide was spot-on as usual. Do make the trek over to this side of Slovenia if you want a truly jaw-dropping experience. Progress was deliciously slow, breathtaking, and bountiful. Plenty of stops were made to drink in views, snap photographs, and roll video. Tea needed to be brewed. A lunch stop was, of course, obligatory. In total, it took nine hours to cover about 100 miles. That’s right, we barely covered 11 miles per hour, despite Google’s cheerful estimate of two and half hours. Google’s massive under-estimation of how long it would take to drive the distance soon became a feature of the trip. Take the figure that Google says, double it, and you’d be about right. By this point of the trip, the ‘unmissables’ listed in the Rough Guide were joining forces with Google’s complete disregard for essential human needs. Way more driving than originally anticipated was taking place. However, these two forces were about to be joined by a third that would slow the pace even further. You see, if you drive along the motorway at high speed, you have to concentrate on the road ahead and behind you, but there is little else to occupy your mind. The radio, a podcast, some music, or a chat with your passenger all help pass the time. However, when your senses are being assaulted every single second with the most mind-blowing jaw-dropping goosebump-inducing scenery that you have witnessed in living memory, your mind quickly becomes tired. Really tired. All that stimulation and beauty needs to be absorbed and processed. It is this process that slows the journey even further. 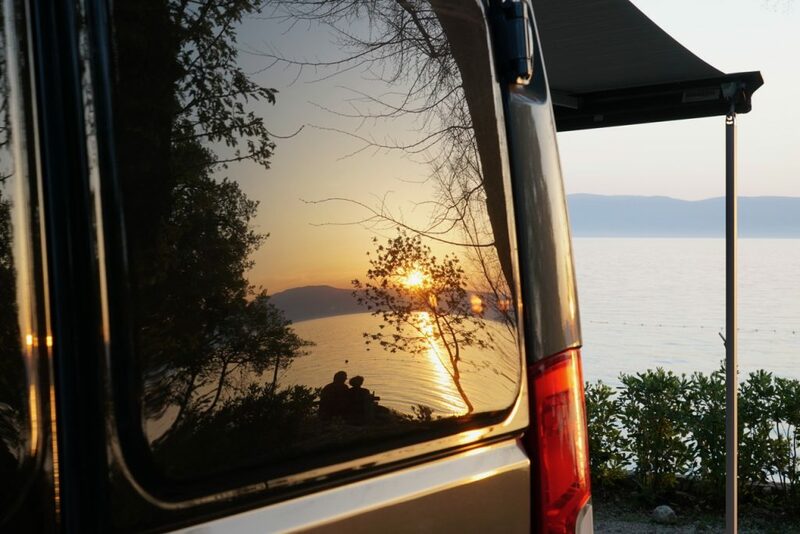 By the time we had reached the beautiful and friendly Autocamp Draga campsite in Mošćenička Draga, I could take no more. My head was full to bursting and I really needed to stop driving for a day or two and let it all sink in. There was also the less poetic business of laundry and backing up video footage that needed taking care of. Let’s not forget some of the advantages of having a loose agenda. It was while reading the Rough Guide at Autocamp Draga that I realised that we could follow our route by taking in three islands instead of just driving around the coast. 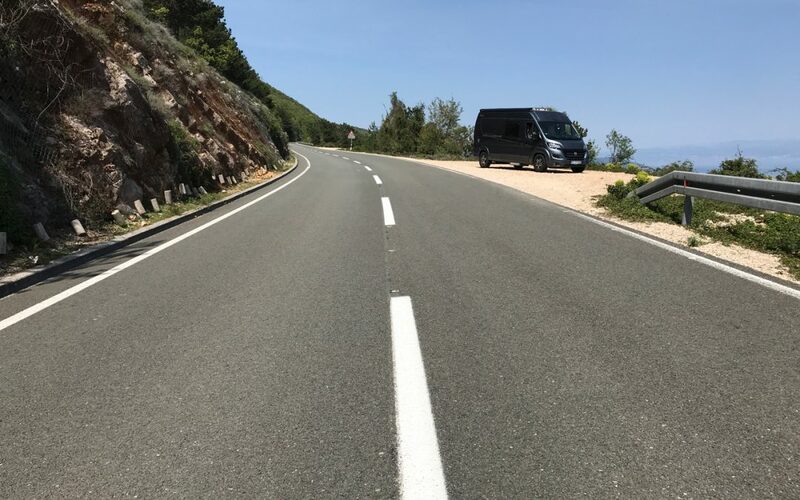 We enjoyed a fantastic day’s touring, taking in the island of Cres, but as we arrived in Krk it became clear that getting to the island of Rab would require a four hour wait for the ferry, only to arrive at 8.30pm and then have to find a campsite. So I consulted the ACSI app and saw that there was a site nearby on Krk called Camping Njivice. It looked OK, I fancied calling it a day, and twenty minutes later we were checking in. This has to go down as the most amazing campsite pitch I have ever experienced. What makes it all the more thrilling is that this discovery just ‘happened’ by Going with the Flow. There was nothing planned or anticipated about this amazing place. I wanted to stay here for a week, but in my reckless ‘outline planning’ stage I had agreed to meet my travel buddy James in Split… five hours away by motorway to the South. By this point I was already half way through the trip and had abandoned all hope of getting to Dubrovnik or Bol, but was consoling myself with the grand plan of a return trip for a much longer period of time. Two days and over 400 miles later, I was back at Njivice with James. Our progress North was equally as slow as the progress South. After dropping off James at Munich Airport and reluctantly returning the van to Carado, it was time for the two day drive back to the UK. I couldn’t even face putting up the tent at this point and took the easy option of Ibis Budget hotels. So what did we take away from that trip, other than some astounding memories, stunning photography and awesome video footage? A van such as the Carado Vlow is the perfect vehicle for such a touring trip. There is no time lost setting up on site and then going out to explore – the journey between the sites IS the exploration. Touring in this manner is immensely stimulating to the senses, which means it is far more tiring than you might first imagine. Touring in this free and relaxed manner is only really feasible during the low season when you don’t have to book campsites. The ACSI Camping Card saves you money if you are a couple, but does not always offer such a great saving when touring solo. However, the consistently high quality of the sites and the ease of discovering them with the app still makes the card worth the purchase. Lack of planning allows for spontaneity. However, too little planning can also be detrimental. I wish I’d read the guide books before arranging the trip as I would have reeled in the outline plan. With your outline plan, decide how many days you will take and how many miles you will cover. Then either half the mileage, or double the time. Or, ideally, both. Scenic roads can slow you down to an average of between 10 and 20 miles per hour. Really. Even if there is only one driver in a couple, a solo traveller should realistically aim for 50% of the mileage of a couple. Why? Because the solo traveller has to do absolutely everything one task at a time, from planning to driving to laundry to food shopping. Don’t stress when you realise that you can’t do everything you had hoped to do. Channel your energies into planning a return trip instead. Slovenia and Croatia are stunning beautiful countries. GO! A detailed itinerary of sites, mileage, and time spent travelling is given at the end of this blog entry. You can watch the entire trip from start to finish by checking out the playlist on my YouTube Channel here. You can find out about the ACSI Camping Card scheme by clicking here. Finally, do have a drool at the Carado Vlow V600 that enabled this stupendous trip by clicking here. I simply cannot wait to return to Slovenia and Croatia. Next time it will indeed be for a far, far longer duration and I won’t be spending an average of six hours per day travelling. Day 20: Oostende to Eurotunnel and home.